Got a tip from a fellow collector (Nathanlg) about Derrick tweeting about a grand opening he was appearing at in Austin. Nathan and I go way, way back, however we hadn’t spoken in some 20 years, but we had been kicking the can for sometime about covering an autograph event together, since we are both avid collectors. We hit the Total Athlete grand opening a few minutes after it started. I was really surprised that the location was the former maintenance hangar of the Pflugerville Municipal Airport. For many, many years, I’d drive by the airport on Howard Lane when I was younger. I don’t think it’d ever strike me that I’d ever go there one day for an autograph signing. Makes me think again about how small the world is physically, spatially, and socially. Derrick was not only in attendance, – the whole building was decked out inside with amazing full size banners of him. The facility itself specialized in resistance training. It had a few weights, but the majority of it was built towards strength and conditioning, with half of the surface covered in synthetic turf. There were a few local vendors there, and a few former UT personalities showed up including Lee Jackson, Brian Orapko, and Tim Crowder. I even ran into a former San Antonio Talon who is a trainer there. Again- small world. It took me a while to get around to Derrick with Nathan. I think we both didn’t want to just walk in and crash his grand opening for autographs right off the bat. While Nathan had this really nice custom replica UT helmet he made signed, I was able to slip in afterwards for a few signatures on these cards. I brought up the 2005 draft with him and how he was almost a member of the Houston Texans, not once, but twice. He almost sounded like he had a chip on his shoulder about it, and recited to me with a chuckle, how the Texans took Travis Johnson instead. I lamented to him about what could’ve been the combination of Derrick Johnson and De’Meco Ryans the Texans might have had. He grabbed all 4 cards out of my hand and signed each one without blinking an eye. It was very nice of him. Score 2009 is one of my favorite sets of the past ten years or so. I really like the distinctive design and splatter art effect. It’s just very stylish. I do go out of my way to get cards autographed from this set when the opportunity presents itself, so I was really pleased to get this one. The rest are a mishmosh of different cards from different sets that I had acquired or wanted to study. 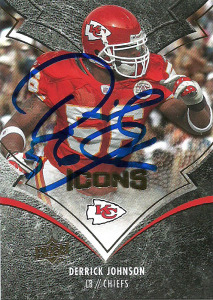 I do like this Upper Deck Icons card. Again, a really well thought out design. I like how the figure breaks the plane of the design, and the red streaks slice up the metallic border. On the other hand, the 2012 sets are a really bad let down. I thought that the Donruss Rookies & Stars 2012 set would be as good as their 2011 and 2010 offerings but sadly it evolved into this flat and boring design. I should’ve just trusted my instincts since there was no preview of the card on the outside of the box. Likewise, Score went the same direction with their 2012 offering which I yawned at. It’s just so- boxy. Very trite. 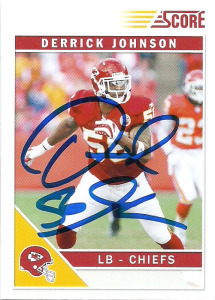 After the 2013 season, Johnson engineered another ProBowl appearance. He earned Defensive Player of the Game Honors for Team Rice notching 9 tackles and a pass block. 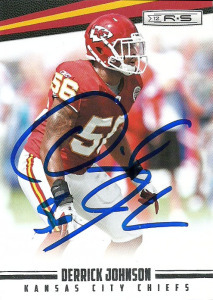 Derrick afterwards was off to a fast start during Week 1 in 2014, if not for a torn Achilles he suffered against the Tennessee Titans, eraisng his entire campaign. 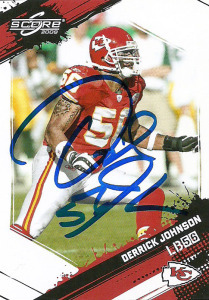 In 10 seasons playing inside at linebacker with the Chiefs, Johnson’s 981 tackles rank third in team history.